The bow of the Titanic as found in the North Atlantic. copyright RMS Titanic, Inc.
As part of the Titanic’s 100th anniversary commemoration, Houston Museum of Natural Science opened the doors to Titanic: The Artifact Exhibition on Friday, March 16. On April 15, 1912, Titanic, the world’s largest ship, sank after colliding with an iceberg, claiming more than 1,500 lives and shaking the world’s confidence in the infallibility of modern technology. HMNS’s exhibit showcases more than 300 pristinely preserved artifacts retrieved from Titanic’s debris field and recreations of the ship’s interior. Thousands of hours of painstaking conservation measures now allow these artifacts, including delicate bottles of perfume, china and various personal items to tell the story of the Titanic’s more than 2,000 passengers and crew. Participants in our course “Titanic: A Tragedy Revisited”, which begins April 5, have the opportunity to experience a guided tour of this exhibit. Led by expert instructors, this course will examine the Titanic from many angles, including the lives of the individuals on board, naval technology of the era, discovery of the wreckage as well as the resulting new era of preservation and archaeology. 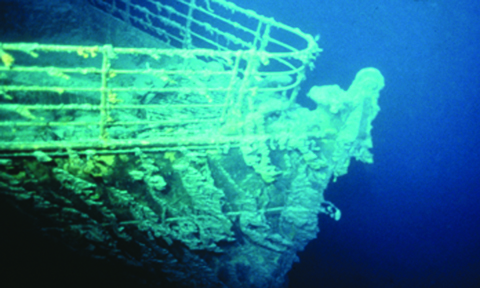 Register for “Titanic: A Tragedy Revisited” by March 22 for an early registration discount.